I’m pleased to officially announce the following results from the first CMQG raffle. A big thank you to everyone who entered, your support ensures the sustainability of our guild. The raffle was drawn at 4pm on Sunday the 9th of August 2015 under permit number ACT R 15/00278. As we start a ‘new’ year at the guild, we have found a new home to host our guild events. The Civic Library was great, however we have outgrown the space, and the Downer Community Centre will provide us with more space, better facilities and a place for our sewing days too! The Centre is located in Frencham Place, Downer, with plenty of onsite parking. The guild continues to meet every fourth Thursday of the month from 7:30pm at the Downer Community Centre. Our 2015 meetings will be held on 23 July, 27 August, 25 September, 23 October and 27 November. These meetings are a great opportunity to catch up with members, learn a new skill and be inspired by the incredible show and tell that we all love each month. Bring some hand sewing, supper (cake is always welcome!) and enjoy sharing and learning with our amazing community in a fun and friendly atmosphere. Meetings are open to the public and free for members. Want to join us? Visit our membership page. 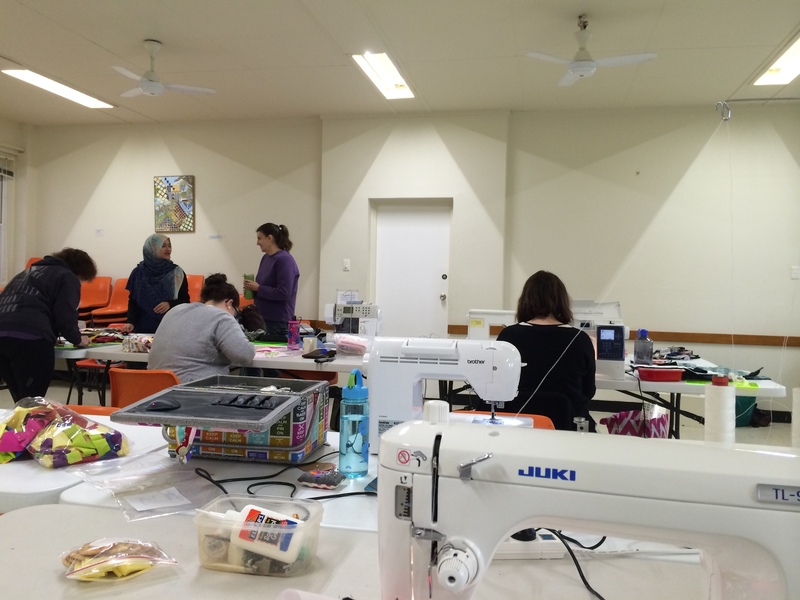 Sewing days will be held on the first Saturday of the month from 10am to 3pm at the Downer Community Centre. Our 2015 sewing days will be held on 1 August, 5 September, 3 October, 7 November and 5 December. Come to a sewing day and you can hang out with awesome quilty people while you catch up on your sewing projects. Tables and chairs are provided, please bring along everything else you need for sewing, including your machine, power cords, irons and cutting tools. Sewing days are open to the public and cost $10 for members or $20 for non-members (for more information, please visit our membership page). Tomorrow is our April meeting, where has the time gone? Amira is going to show us how she uses her portable design ‘wall’. We will be meeting at the Civic library at 7:30pm. Bring your show and tell, name tag and something to work on. Better late then never! In the second members spotlight, I would like to introduce Monica! You might know her as Squeak Ahoy on Facebook and @monnsqueak on just about anything else. She doesn’t use her real name on facebook because she works with kids and teens, and they’re not very good at boundaries, so this makes it a little harder for them to find her! Tell us a little bit about yourself Mon! What got you interested in quilting? When did you first find modern quilting? And, do you do any other craft besides quilting? I’ve been making things since I was a little kid. I don’t remember learning how to thread a needle, or to make a basic stitch, so I must have been quite young. I do remember learning to knit from my nan when I was about 4 or 5, and refining the basic knit-stitch knowledge with a very old book called Fun With Wool. Since then I’ve explored lots of craftarts, including embroidery and cross stitch, knitting, crochet, handspinning, as well as painting, drawing, printmaking and calligraphy. I used to go into quilting stores just to look at the fabric, but had never owned a sewing machine. After so many years of using my hands, I started to get symptoms of damage, with shooting pains and tingling in my hands and forearms, and so I ditched the hand-work and switched to machine sewing. 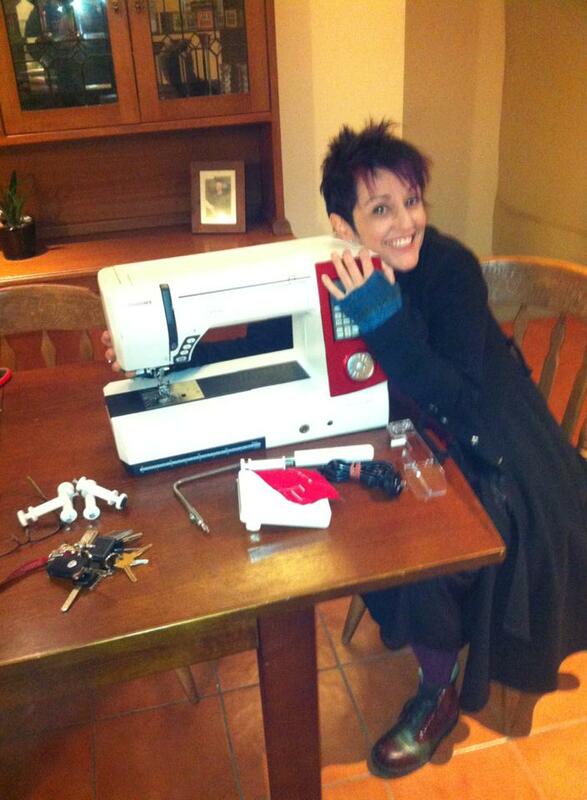 The first photo is me hugging my Janome 7700 the day it was delivered by courier. Very exciting! I first started with a $100 machine that I got out of the local paper, though, and with bag making, and after almost a year of this, made my first quilt a bit over a year ago. I guess the modern style was part of the choice to try quilting – I’ve never been attracted to traditional style quilts, but I liked the bold fun style of a lot of the quilts I was seeing online. So my very first quilt was completed in January 2013 using the Bento Box pattern and some leftover fabric I’d been using for bags. I used bamboo batting, and quilted it myself on my tiny $100 machine (it was then that I decided to buy the 7700 for its larger throat space). I didn’t know anything then, so I didn’t wash it, and I think it still hasn’t been washed over a year later! oops! Here’s a picture of her holding it up. I quilted it edge to edge with a meandering stitch that I happily referred to as “drunken snail” at the time. 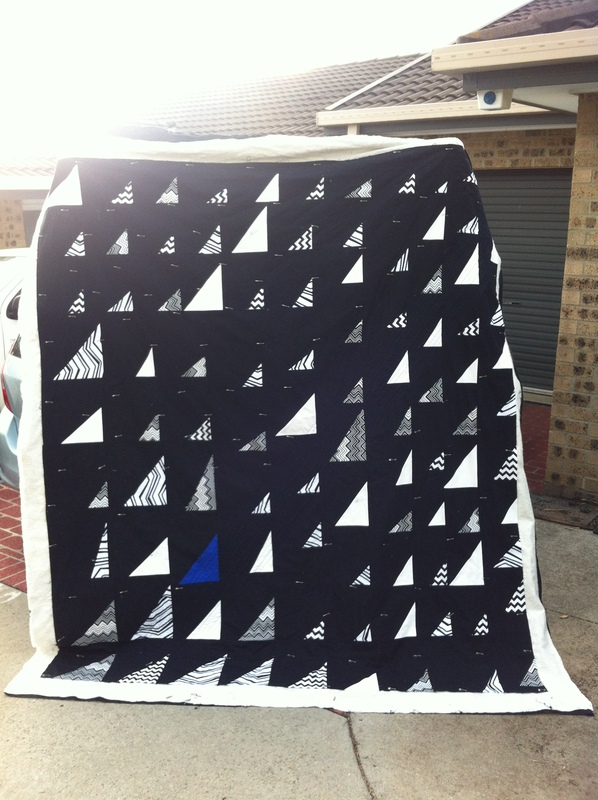 The most recently completed and photographed quilt is the Dark Star quilt, which is very different! 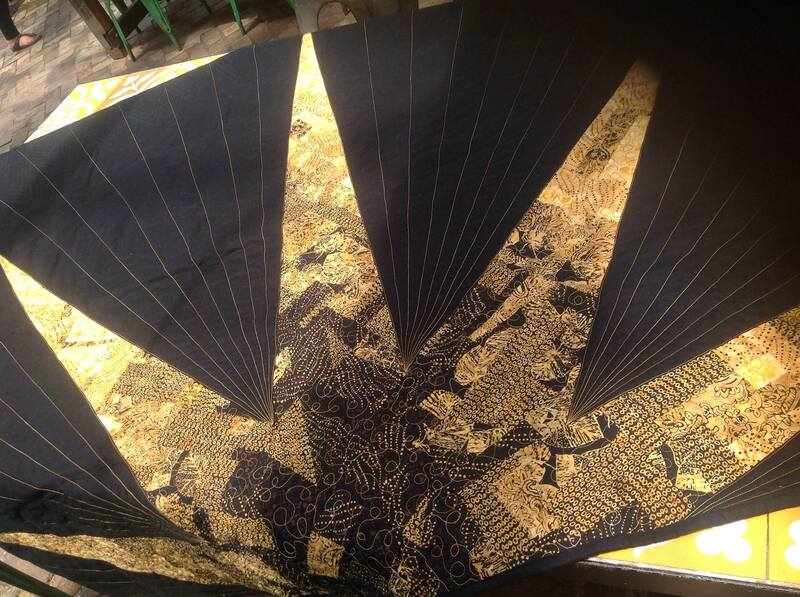 It was a fully improvised quilt design of my own making, using a little fat quarter batik set in black and gold (not metallic). I made a crazy-quilted triangle and cut it into the points of a star, and whacked it all together with black to make a large lap quilt for my old supervisor. I used FMQ and straight line quilting to bring it together. I’m currently working on a quilt for my brother, who asked for something in “black and white and a splash of electric blue” 🙂 I’ve gone with a modern design based on Alissa Haight Carlton’s “Didn’t get the memo” and I’m actually not enjoying the straight-line quilting I’m doing on it much – it’ll look nice when it’s done but it takes SO LONG! And because I’m pushing it to be done in time for a quilt show, I’m not doing my usual trick of working on it for a while and alternating with other projects. Black, white and a pop of blue! Where do you find your inspiration? Who are your quilt idols? I tend to pick inspiration up from everywhere. I take pictures of weird things like clouds that I like, or shadows on things, and come up with ideas from those types of things. The dark star quilt was dreamed up thinking about hope coming from the dark things in our life, and I thought a gradation of gold coming out of black would be a beautiful representation of this idea. This was a quilt that I had no idea what it would turn out looking like – I just started, and was quite surprised when it came out. Others I’ve made have been meticulously planned, every piece of them. At this point I’m still learning, so each quilt is different in process and design. I do tend to prefer making my own designs – patterns seem to waste a lot of fabric and I find them frustrating and tedious, whereas the process of making my own designs and just going for it is a purely joyful experience for me. My quilt idols are my friends and fellow guild members, I’m so impressed with the vast creativity in our lovely little Canberra MQG! No particular list of techniques to learn – I am an information junkie, and I absorb knowledge as I go. Often I’ll hit a roadblock and then decide I need a certain technique to get past it, so I go on a search-n-destroy mission to find what I need at that point to move on. Sometimes I imagine something wonderful and just need to find the technique to express it (like the stars for the Riley Blake quilt, which were a variation on the porthole technique used by bag makers for set in zippers). I learn new techniques usually by photo and video tutorials online. I remember the old days of searching out books in libraries, and while I will always adore libraries, I cannot imagine being without youtube and the vast array of bloggers and their wonderful generosity in sharing their knowledge. 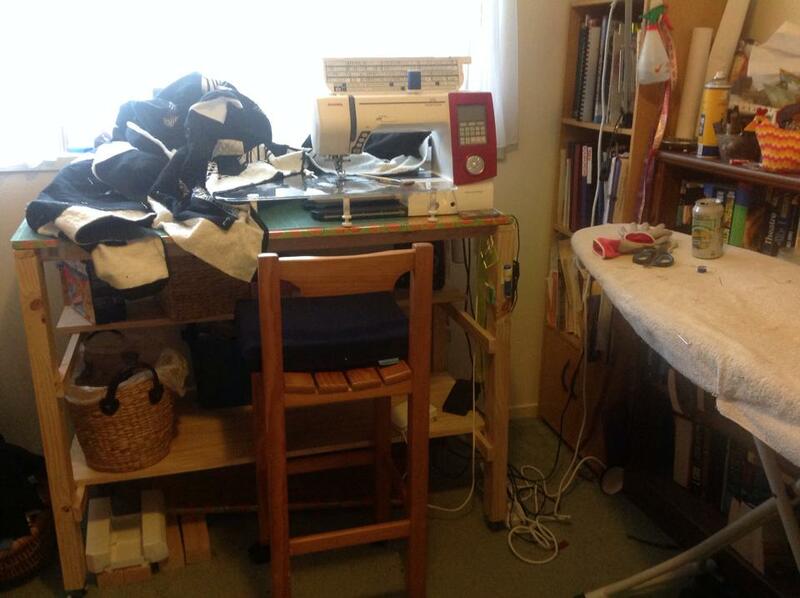 OOOO – My sewing space! This is my pride and joy. I get a lot done not because I’m motivated but because I have an efficient space set up permanently – so if I have ten minutes spare, I spend ten minutes sewing. Works very well. My table, which I designed and made myself, can be used sitting or standing (this helps reduce fatigue). I store my fabric folded in square baskets and in clear DVD boxes so I can see at a glance what I have available, and I’m in the process of colour sorting my scraps and cutoffs. I know not everyone has a spare room to set up as a workspace, but if you can spare a corner, it makes a huge difference. Also, if you look closely, I use MANY hooks and and cuphooks to hang things from, as well as 3M velcro, which I stick awls, needle cases and other things to, so they’re always within easy reach. No precious time spent rummaging for things. My blog is monnsqueak.typepad.com and monnsqueak (two n’s darlinks) is the handle I use everywhere, twitter, flickr, instagram (i really need to start using that) as well as a few other random sites. Who’s inspiring Gemma right now? Gemma used to read a lot of blogs but these days she struggles to find the time. She does spend a lot of time on Instagram – it’s a great place to seek inspiration from other arty types. So here are five people (with their instagram names) who are inspiring Gemma right now! I love Kathleen’s IG feed. Serious quilt talent and inspiration! Her quilting in negative space is just wonderful and I particularly loved her recent supernova quilt. If you’re into quilting and you’re on IG then you need to follow Kathleen! Check out this blogpost with lots of serious quilt candy. I cannot do justice to Renee’s recent “The Pandorica Opens” quilt (above). Full disclosure, I’m a serious Dr Who fan and have been since childhood. But even if you’re not and even if you cannot appreciate just how freaking cool an exploading tardis quilt is, you can still appreciate the skill in this recent piece! Go look now. Now. Just go do it and then follow her everywhere and have your mind blown. Freaky, freaky, freaky fantastic Dr Who/Van Gogh quilting! I think you get it. She is truly inspirational! If I ever meet Latifah I’m going to struggle to string a sentence together. When everyone else had been doing “low volume” forever and we’d all been amazed at how cool it was and we could even buy “low volume” bundles so there was no personal choice left, Latifah took it to another level. AND she told us that it took her three years to finish that quilt! 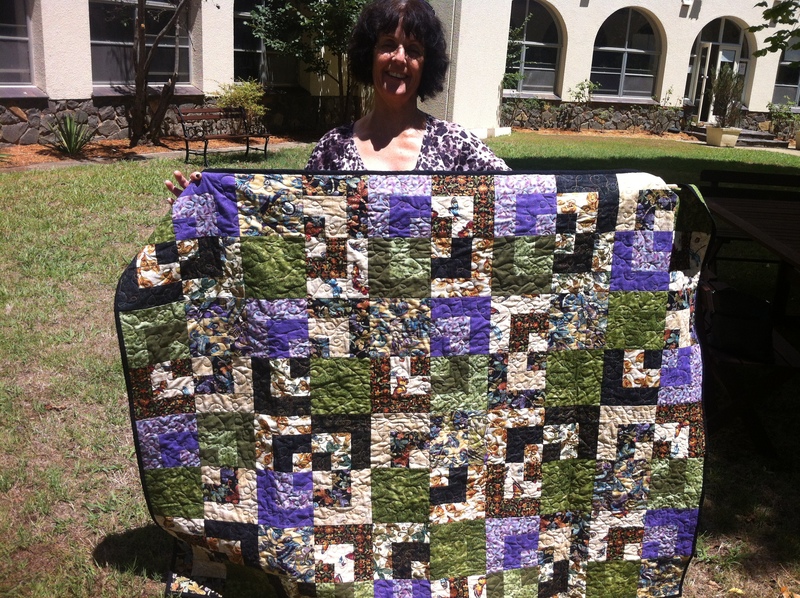 I love a quilter who shares all, I love an honest quilter. Latifah is a bit of a legend in my book, but I just find her crisp lines, bold colours and down-to-earth nature inspiring. Oh, and she said I should buy a vintage Singer, so I did. This girl is a classic over sharer. And I LOVE her for it! Her life looks like so much fun! Her cute haircut, her puppy, her hilarious expressions, oh and she works for Robert Kaufman, spends half her life at Disneyland and has an impeccable eye for colour. Seriously though, I really do find Elisabeth’s work inspiration. I love how she throws colour after colour at IG (be it macroons, minifigs, farmerswife blocks or her recent finish, night sky quilt. She is also an awesome FMQer and a great source of inspiration. So there you go, that’s who is inspiring me at the moment. It was hard to single it down to five as I currently follow 685 people on Instagram and many of them inspire me. Oh, I totally forgot, you have to check out @houseofalphonse on Instagram. Her papercut artwork blows my mind!